Qatar Airways has announced that the world’s most technologically advanced passenger aircraft – the A350-1000 – equipped with the airline’s luxurious, award-winning Qsuite, will be available on flights to and from Singapore and Tokyo. The new service to Singapore’s Changi Airport launches on 1 November 2018, with the aircraft due to be introduced daily to Tokyo’s Haneda Airport from 1 January 2019. 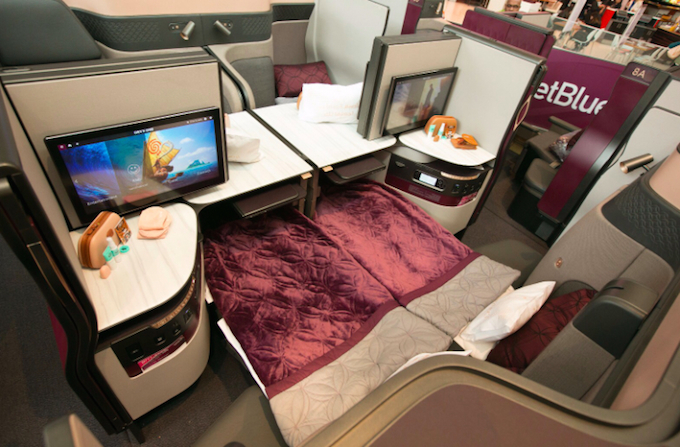 Qatar Airways Group Chief Executive, His Excellency Akbar Al Baker, said: “We are tremendously excited to bring the world’s most technologically advanced passenger aircraft fitted with revolutionary Qsuite Business Class experience to our loyal customers in Singapore and Tokyo. One of the latest additions to the Airbus family of twin-aisle, wide-body jetliners, the A350-1000 offers 327 seats across two cabins – 46 Qsuite Business Class seats and 281 extra-wide 18-inch seats in Economy Class. Similar to the A350-900 – for which Qatar Airways was also the global launch customer – the high-performance A350-1000 boasts an advanced airframe with extensive use of composite materials. Coupled with a fuselage innovatively built with carbon-fibre reinforced plastic, the jetliner burns lesser fuel, reducing harmful effects to the environment. On the inside, LED mood lighting mimics a natural sunrise and sunset to help reduce the effects of jet lag.